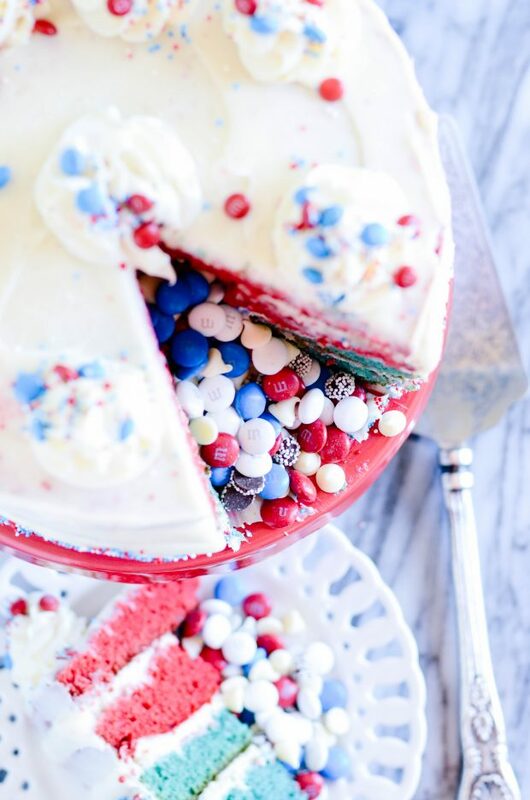 Fun and festive red (and blue) velvet layers of cake complete with cream cheese frosting and a fun surprise candy filling! First, JULY 4TH!!! Little fun fact about Ashton: I love the 4th of July! I’d have to say it’s tied with Thanksgiving for my absolute, all-time favorite holiday. 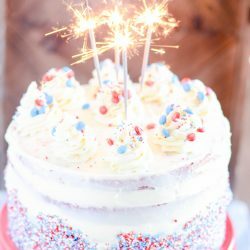 At one time, my birthday would have won out as my favorite holiday (also in July, which I think is where my affinity for the 4th originated) or maybe Christmas. But adult-hood has worn me down, and now neither of those holidays holds quite the same appeal as they once did. Mamas, I’m sure you know what I’m talking about. ???? 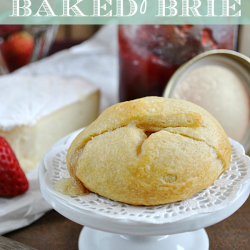 Another reason I’m so pumped about this cake– HELLO! Sparklers?!?!!?!!!! 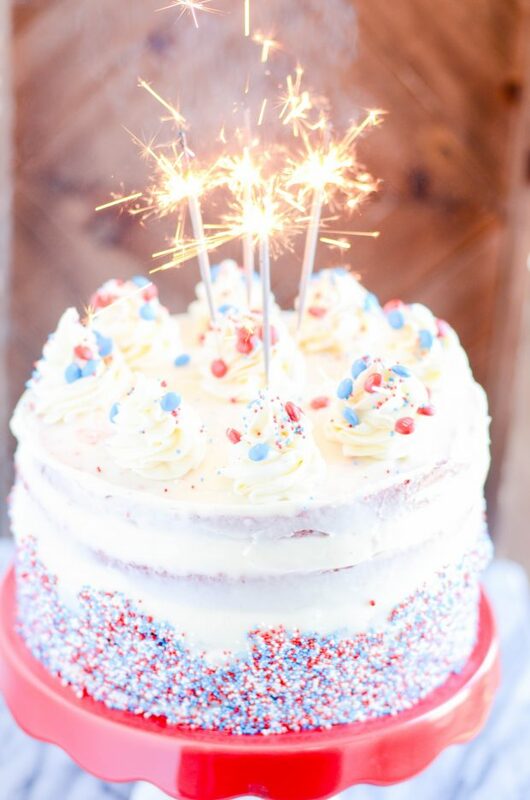 I have been dying to put sparklers on a cake for basically my entire life. And I’ve just been too scared to do it, because I figured I’d light something on fire or melt the frosting or it wouldn’t look as cool as what I’ve seen in pictures. If those have been your fears too, forget them all! It’s totally as cool as it looks in pictures. And nothing caught on fire. DO IT. 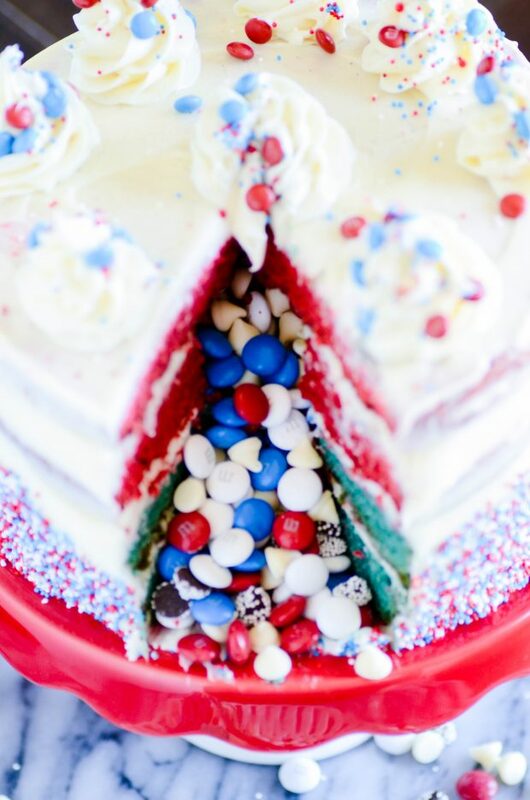 The entire cake is chock-full of candy– just like a piñata! I used M&MS, obviously, because they’re so delicious AND festive. Plus, I love the texture of crunchy M&Ms with the soft cake and creamy frosting (food texture freak = me). 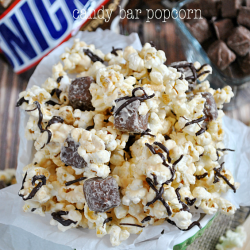 I also used white chocolate chips and Snow Caps (my movie treat of choice, in case you were wondering). 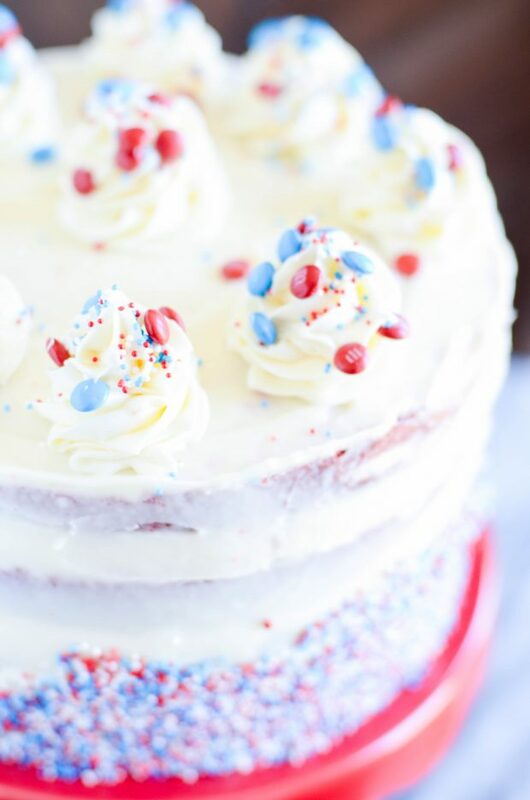 I used my favorite red velvet cake and cream cheese frosting recipes (Cake Man Raven’s Red Velvet Cake), but I split the batter in half before adding the food coloring so that I could make half of the cake blue. But next time I make it, I don’t think I’ll bother with the blue. The red would have been festive enough, I think. And the blue just didn’t come through as well as I wanted it to. Just a little hindsight for ya there. ???? But it does! It’s so cool. Just slice the cake, business as usual, and when you pull the slice away– all this candy cascades from the center of the cake. And then everyone thinks you’re the coolest person ever, end of story. All you’ll need is a cookie cutter to cut a circle in the center of the three bottom layers (leave the top on whole, kind of like a lid). 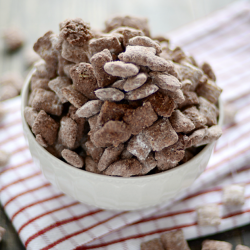 Once you’ve layered the bottom three together, fill the hole up with candy and add the top layer. Frost it like you normally would, and nobody will have any idea what amazing awesomeness awaits them after the first slice! Enjoy, my friends. And Happy 4th! 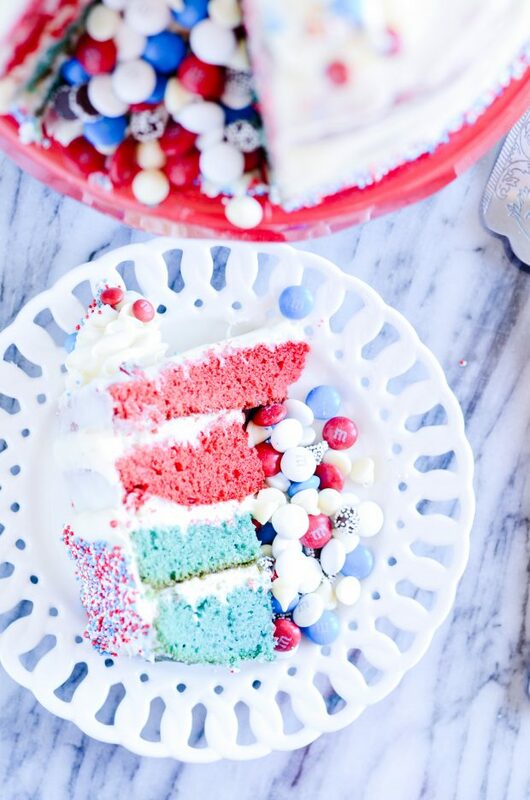 Split each cake into two layers. Use a 2-inch round cookie cutter to cut a hole in the center of THREE layers of the cake. Frost each layer of cake with a hole in the center and stack them on top of one another. 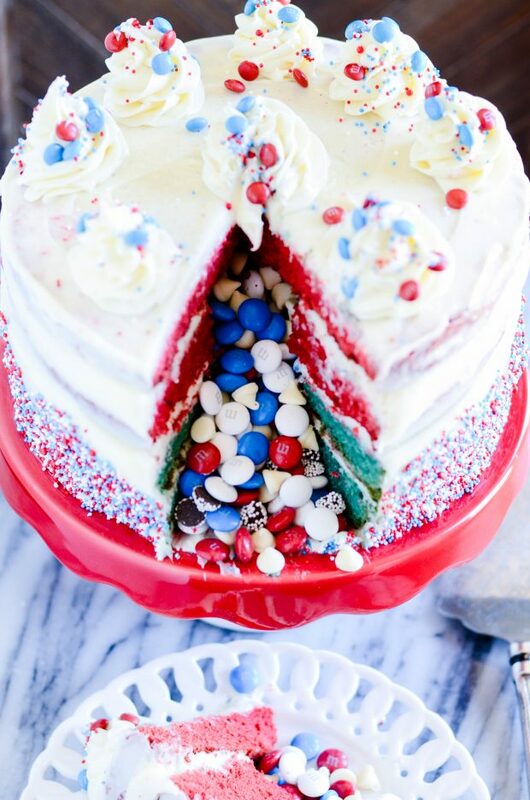 Fill the hole with the M&Ms, Snow Caps, and white chips. Add more frosting and the final layer of cake. Spread frosting on the outside of the cake. 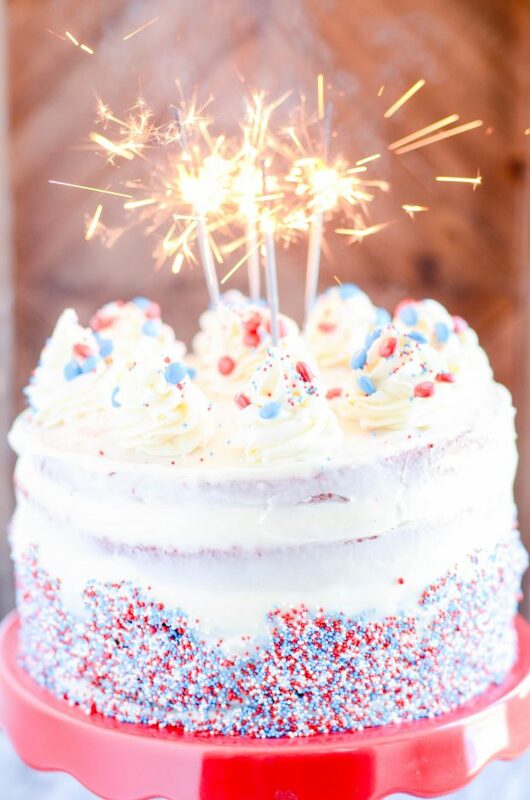 Decorate with additional sprinkles, candies, and sparklers if desired. DO NOT CHILL (the M&MS will bleed their color). *If desired, split the batter in half before adding food coloring. Add 1 tbsp blue food coloring to one batch and 1 tbsp red food coloring to the other batch.